Home Learning Commons Student Tutors Needed! 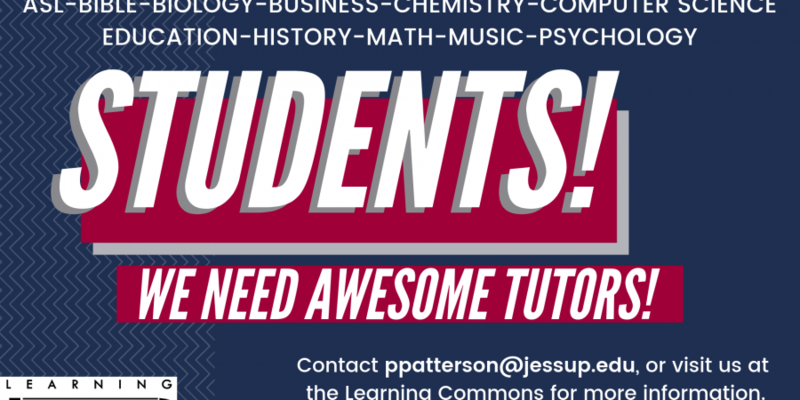 Posted on April 12, 2019	by Paige Patterson	in Learning Commons	with Comments Off on Student Tutors Needed! Are you a student with a GPA of 3.5 or better? Do you love helping other students in your classes? Are you looking for an awesome on-campus job and SFG experience in the fall? If you answered “Yes!” to these questions, come to the Learning Commons and find out more about our student tutor opportunities! For more information, please contact ppatterson@jessup.edu.